Condition monitoring and analysis of mining equipment requires more than suitable and reliable sensor technology, but also a holistic approach that makes use of interdisciplinary capabilities and intelligent software applications. Today, modern sensors consist of hardware and software components and ensure that machine data can be recorded and transmitted at any time. The Internet of Things (IoT) uses innovative software solutions to process the data collected on huge data platforms to make it available as valuable information. It is only with these technologies that the sensor data on the machine condition, which is available today but still little used, can be processed in such a way that measures for a considerable increase in availability and productivity can be implemented. From the point of view of a technology company, the next stage of digitization can only be achieved through strong and interdisciplinary cooperation between mining companies, machine and plant manufacturers (OEMs) and technology companies. Mining processes are complex and mining equipment – mobile, semi-mobile or stationary – is capital-intensive. In underground mining standard load-haul-dump (LHD) vehicles are approximately 70 % more expensive than wheel-loaders and/or trucks with the same capacity used in surface operations. In large opencast mines, huge off-high way trucks and heavy excavators and dozers represent a tremendous amount of investment of several hundreds of million US$. However, in surface mines or in underground mines, mobile mining equipment, as well as stationary machines like processing plants, do contribute the main share of capital expenditure (CAPEX) in mining. Operational expenditures (OPEX) are another major concern in mining. They are decisive for being competitive or not and can easily amount to a sum threefold of what was invested as CAPEX. Maintenance costs for mobile equipment often account to up to 25 % of total OPEX. Adding the costs for running processing plants to this, will display the largest share (> 50 %) of total spending during the life of a mine. Hence, maintaining machine fleets and processing plants should be the main concern when mining operations need to improve their margin. Digitalization offers the opportunity to claim a further piece of this potential. Additionally, mine managers are facing further major challenges: skilled and experienced labor is more and more difficult to source as mining exposes to rough and hazardous working conditions and/or is practiced in remote areas. In short, the mining industry seeks reducing risk exposure as well as increasing efficiency and productivity through the whole mining process and over all types of machinery. To do so, the industry follows various initiatives of improving existing measures and tools, such as smart sensors, condition monitoring systems, on-board assistance systems, or implementing new technologies, like autonomous operations and robotics etc. Most of the measures are understood to be related to the Internet of Things (IoT) or Industrial Internet of Things (IIoT). Almost all players in mining industry follow the implementation of IoT related operations, products and services. To name a few: Rio Tinto established “The mine of the futureTM” (1) in 2008 implementing intelligent tools and a remote operations center for autonomous operations in Perth/Australia; Anglo American (2) introduced autonomous drills in underground mining as part of their FutureSmart MiningTM. Original Equipment Manufacturers (OEMs), like Caterpillar (3) and Komatsu (4, 5) or Sandvik (6), Epiroc (7) and Metso (8), or service companies, like DMT (9), developed data driven and connected devices, including smart sensors, to generate and utilize data. Last but not least, new tech players in the mining industry offer IoT solutions providing advanced and predictive analytics, often not linked to traditional OEMs but independent and universally applicable. They all have in common to stand on the doorstep into the digital age. For mining companies, as in most manufacturing industries, one of the key performance indicators is asset uptime. Hence, preventing equipment failure becomes crucial. Gathering data and insights on the machine, continuously or periodically, to be able to implement measures before failures occur is known as condition monitoring. Condition monitoring is not unique for the mining industry, but broadly applied in other industries as well. However, the rough and harsh environment, the continuously changing conditions make mining operations standalone. Condition monitoring in mining does not distinguish between machine monitoring and process monitoring, but explicitly combines both. A web-based approach to mining condition monitoring should therefore take a holistic approach that goes beyond machine condition monitoring to process condition monitoring. A more complete picture, from which suitable measures can be derived, e.g. for predictive maintenance, only emerges from a joint appraisal. For a basic understanding, the essential elements of condition monitoring are briefly described in the following (Figure 1). Fig. 1. Condition monitoring process. // Bild 1. Prozessablauf in der Zustandsüberwachung. Condition monitoring was predominantly developed for the application in static production processes, such as oil refining, machinery manufacturing or energy production. It is based on continuous or periodically measurable physical events, such as vibrations, temperatures, forces, current, mechanical wear etc. of dynamic components in machines. By measuring various parameters (vibration, temperatures, throughput etc. ), of certain components during operation, their remaining lifetime can be estimated. It is further necessary to understand when and in which frequency measurement needs to be done (start-up, normal operation cycle, overload) leading to certain events (wear-out, overheat, damages of certain machine parts). In mining, conditions of machines depend on various influences from environmental conditions, e. g. weather, and operating conditions, e. g. road inclination, road conditions, mineral grain size, loading cycles, and operators handling. The data acquisition model is created by summarizing all knowledge or understanding of what needs to be monitored when and how. Thus, the data baseline for sourcing insights from the monitoring is defined. As a next step, the data which was defined to be relevant in the data acquisition model needs to be sourced. Therefore, it is crucial to have a clear understanding “with what” sensors the data can be acquired. Nowadays most new machines are supplied with a full set of different sensors pre-installed. The range of sensor varies broadly from single to multi-measurement sensors, storing and transmitting data capabilities, integration and connectivity capabilities with different hardware and software. Sensors today are intelligent and smart, means that they include micro-controllers, which enable them not only measuring single signals but also processing the complete set of signals. 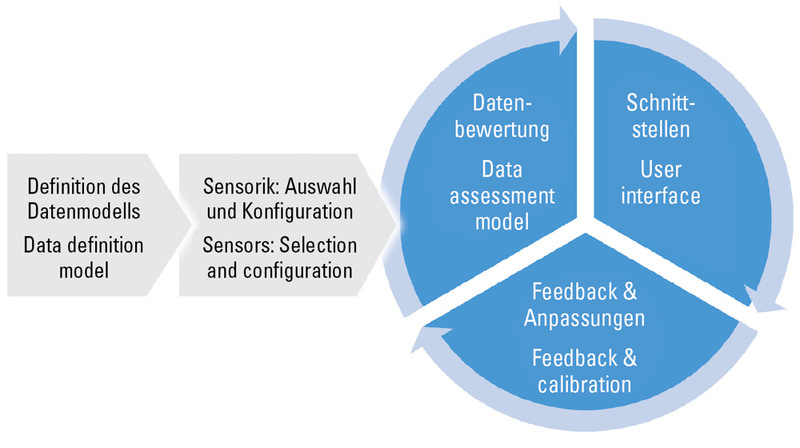 In this regard, it is common to take existing sensor configuration into account while working on the data model. However, when it comes to retrofit-solutions most clients are reluctant as acquiring and installing a large number of suitable sensors can be quite costly, not taking into account the additional downtime of the concerned asset. Another issue in mining industry is common variety of machines from various OEMs in one fleet. Also, standards for internal data transmission in mobile equipment do exist but are respected rarely. Furthermore, OEMs tend to be sceptic or strongly dismissive about opening their machine´s data protocols to third party suppliers or service providers. However, a number of hardware and software solutions to tackle this issue do exist. In this approach, the experienced based expert knowledge is primarily integrated in the modelling of condition monitoring. It requires expert knowledge about specifics of operational conditions and experts who are able to define load limits and at which moment the possible wear-out or failure of the equipment can be estimated. This approach is currently most exercised in the industry. However, certain lack of expert knowledge as well as high risk of improper evaluation at the initial stage results in quite frequent failures of the strategy. At first attempt the fear that defined failures will occur more frequently instead of being managed properly, might lead to abandon such initiatives. The right approach to this would be assuming that knowledge-based models need calibration and reconciliation and allow certain time for implementation before the model becomes final. No assumptions are made, but real historical data is assessed. Multi-factorial correlation analyses can be carried out, which make correlations apparent that may not yet have been covered by expert knowledge. The user interface seems to be obvious for automated computer-based monitoring. However, very often it becomes a hurdle during implementation, if the interface is not intuitive enough for various user groups within a company. One further aspect needs to be considered. The integration of condition monitoring software in its role to feed relevant data to other business processes or partners within or outside the company, such as maintenance planning, spare parts management, and budgeting and procurement management. In this regard it is very important to understand how the condition monitoring interface will be integrated into the existing software landscape that is used in the company or otherwise choose a partner that is able to provide and maintain the system allowing integration of all the processes in one single platform. It is a known fact that the development of any monitoring system is a cyclical process that requires permanent tracking of modelled results versus real outcomes. There is hardly any mathematical model in the world that will allow defining its limits in the first go. Having permanent feedback loops supplied into the model allows its continuous improvement and development using new influencing factors that can arise. This is especially important in the continuously changing conditions of the mining industry. Therefore, a crucial point is the ability of the system to provide extensive level of feedback regarding the model that it is using, to achieve steady improvement by further calibration and reconciliation. This should include the opportunity to derive (manually or automatically) historical analysis of the events, interpretations and failures as a sufficient basis of future improvements. It is still common to limit condition monitoring to a single piece of equipment or even certain components of such. Sensor measurement of vibration, noise, oil contamination, pressure losses etc. diagnoses asset health, indicating which machine components are about to fail, giving alerts and warnings to the operator and maintenance crew in order to initiate further actions. However, without additional information about the operational processes further analysis is not possible. Without such adjacent information the causes or circumstances of failures and likelihood to re-occur cannot be defined. With the advent of IoT, equipment is built and retrofitted with significantly more and more digital and/or intelligent sensors (smart sensors) and directly connected to the internet. This enables monitoring measurable condition(s) of a machine continuously and in real-time. Machine data can easily be linked to operational and contextual data, fueling the data base for in depth analytics. Mining companies and OEMs today have recognized that emerging digital technologies, such as IoT, Artificial Intelligence (AI) and machine learning will inevitably change the way of industrial mining. Faster and better decisions based on more transparent and rapidly available information will most certainly be a game changer for managing mining operations. It has now become a matter of course that digitalization of equipment and processes leads the way to a safe, stable and automated production environment. In the initial phase of digitalization, utilizing automated real-time data streams from machines combined with big data technologies and algorithms will enable location tracking, activity monitoring, and continuous machine health information. Mines and operations will become transparent, as well, without the necessity to allocate physical resources other than some hardware updates. Consequently, IoT-based condition monitoring is an essential component and a prerequisite for predictive maintenance, which is based on a holistic view of real-time and historical machine and contextual data, processed by intelligent machine learning mechanisms. The environment described in the preceding is where talpasolutions GmbH, an in Essen/Germany based company, has found its business base. 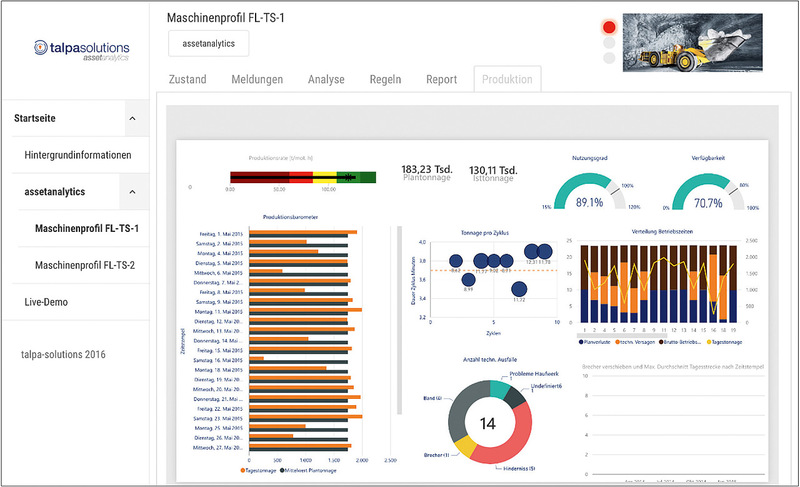 talpasolutions offers an asset analytics platform for the mining industry and OEMs in which real-time and historical data of machines and plants as well as contextual information of operational and environmental conditions can be stored, standardized, processed, analyzed, validated and reflected back in a clear and understandable form (Figure 2). Fig. 2. Software concept of asset analytics – data sources, platform, and applications. // Bild 2. Softwarekonzept der Asset-Analyse – Datenquellen, Plattformen und Anwendungen. The platform provides a broad range of different functions for different user groups in mine operations and OEMs. The platform will enable mining companies as well as OEMs and service companies to create new service offerings. Such, as refined condition and performance monitoring, display of trends and forecasts relevant to planning with regard to downtimes, operational anomalies, consumption of consumables including energy, predictive diagnostic and repair recommendations, optimization of spare parts stocking and delivery. The continuous transmission of sensor data from assets produces multiple Gigabytes of data per day. In order to process this (big) data effectively, tailor made software is required. The software has to be designed to capture all five V’s of big data analytics: volume, velocity, variety, veracity, and value of data (Figure 3). Applying big data analytics needs to reflect the continuous increasing amount of data – with multiple gigabyte per hours to be monitored and processed. To allow a flawless operation of the system as well as a fast response on changes in processes, all data has to be transmitted, processed, and analyzed in real-time, where necessary, especially when real-time alerts are inevitable. When analyzing data of assets from different manufacturers, a broad variety of sensor data can be found. The data differentiates not only through amount but more crucially is transmitted in different formats and units of temperature, pressures, and power or, e. g., different grid standards, when it comes to positioning data. The variety is further enlarged by all kind of mine data, e. g. from environmental or geological origin. As complex analyses can no longer be handled manually to gain added value, advanced machine learning algorithms are applied in big data analytics. They do not only take into account solid measurements but also empirical values of experts and benchmarked and approved best-practice. Last but not least, a fundamental prerequisite is a user-friendly, simple and at-a-glance interface and visualization (Figure 4) which allows personnel with user-/role- specific access authorization to receive the required information and improve the decision-making process in time, accuracy and quality. Fig. 4. Screenshot of the asset analytics. // Bild 4. Screenshot der Asset-Analyse. Today, these are the major challenges in the industry on its journey towards digital transformation and key discipline of talpasolutions. Especially in the fields of maintenance and process optimization in mining industry, the potentials for optimization are significant. This is valid for fleet-wide computer-based adjustments in maintenance, based on live data and accumulating historical data of asset wear and tear. Also, the same correlations can be utilized by leveraging predictive and prescriptive analytics to optimize mixed fleets involved in the mining cycle by a timely coordination of all processes of the production chain. To create valuable insights it is of upmost necessity to gain a fully and deep understanding of the construction and behavior of the machine, of the machine in operation and how the individual sensor data contributes to conditional monitoring and further to insights on the vehicle and the mining process, thus leading to predictive maintenance measures. As operational insights do not focus exclusively on real-time data but on previous findings and experiences, it is necessary to include historical and contextual data. Therefore, such data needs to be uploaded manually or automated via web-based interfaces in an appropriate software format. The actual data processing starts with the automatic recognition of data types and formats, their temporal and spatial allocation to machines and processes. In a further step the analysis of the data processed in this way and the acquisition of valuable operational insights consists of transferring and combining the processed data to the complex processes of mining – and last but not least to the typical success indicators for mine productivity and efficiency. Here is where mining expertise meets IT know-how. Mining experts have a profound machine and process understanding to the data set, which in joint collaboration with the data analysts, is transferred into operational insights (Figure 5). The knowledge-based approach to defining the limits of equipment failure is prevailing in the industry nowadays, due to the facts that no reliable platforms are available for extensive data analytics. Additionally, there is a lack of understanding how to handle various kinds of contextual data in order to build reliable condition monitoring models. However, the data driven approach using amounts of already available historical data is the only suitable way for the future, allowing to avoid assumptions and using multi-factor assessment of the failure events. This is especially the case in mining industry, where operational conditions of equipment are affected by permanently changing work environments. Once the data baseline has been built, changing work environments will not be a concern anymore. Real-time data combined with historical and contextual data will allow to recognize patterns, regardless the frequency of events. Deep learning algorithms will continue utilizing such data-sets to provide operational insights and enabling predictions, as precise as no one can imagine today. IoT being the network of objects such as computing machines, embedded devices, equipment and tools, and sensors; a new level of contextual or relevant data can be sourced. The focus will be set on conditions and processes, and not be limited on single assets themselves. In the mining industry, data is generated in remote mines sites. IoT-connected platforms can store the ever-expanding amount of diversified data from multiple sources and from the machine learning algorithms. 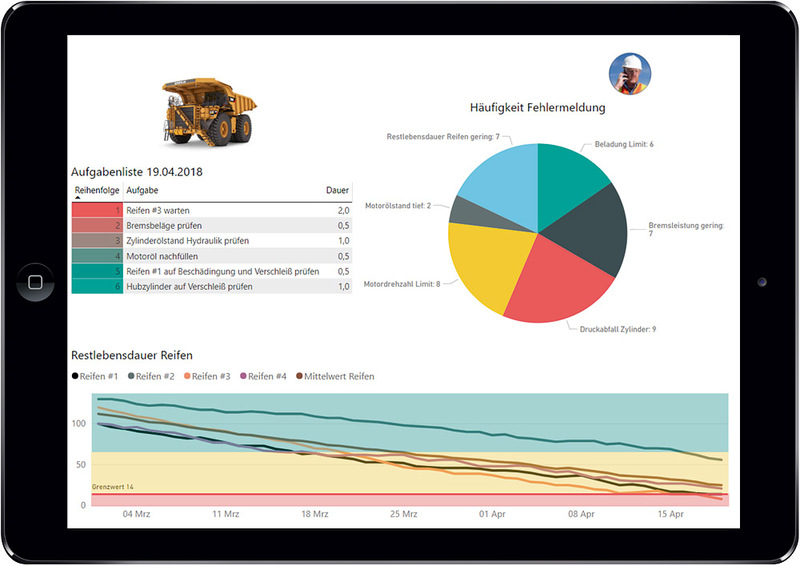 IoT-based condition monitoring is essential for the next level of digitalization of mining. It will open the way to access efficiency levels which have never been there before. Additionally, the risky and hazardous environment will not endanger miners anymore, as they will be able to control the equipment and perform operations from air-conditioned working stations in safe environments. According to the German Mechanical Engineering Association (VDMA) (11), IoT platforms and IoT software will create the basis for a digital eco-system (Figure 6). The mechanical industry is striving to implement and make use of application for their products, their services, and their own processes. The biggest obstacle, however, is the lack of skilled personnel. Conclusively, the answer is to build cooperation between IT companies, machinery and plant engineering companies, service partners, research organization and universities, and last but not least users. Fig. 5. Predictive maintenance will most likely boost up-time of assets, resulting in a higher productivity and cost efficiency. Once sufficient sensors and data are integrated, all crucial parts can be monitored and tasks advised. // Bild 5. Digitallösungen für vorausschauende Wartung, basierend auf Zustandserfassungssystemen, werden die Effizienz des Maschineneinsatzes neu definieren, sobald ausreichende Sensorik flächendeckend vorhanden ist und somit Daten zu allen kritischen Teilen und Prozessen zur Verfügung stehen. Due to the increasing technical complexity of the equipment, an interdisciplinary cooperation between end users at the mining companies, the OEMs and the tech companies is becoming more and more important. In the digital world, collaboration models and agile development tools are not only significant, but also inevitable to be innovative and to keep up with the pace of the industry. The high speed of software development drives the hardware development of machine and plant manufacturers. The need for mine operators to react and make decisions faster, better and more flexible requires that both hardware and software are adapted to the needs of the operation. A dialogue of all stakeholders helps to get a better understanding of the requirements and challenges of each other. The challenge lies in mastering complexity and speed. In this environment, tech companies, like talpasolutions, are driver, enabler and -facilitator. (10) Atamuradov, V.; Medjaher, K.: Prognostic and Health Management for Maintenance Practitioners-Review, Implementation and Tools Evaluations. In: International Journal of Prognostics and Health Management. 12/2017.